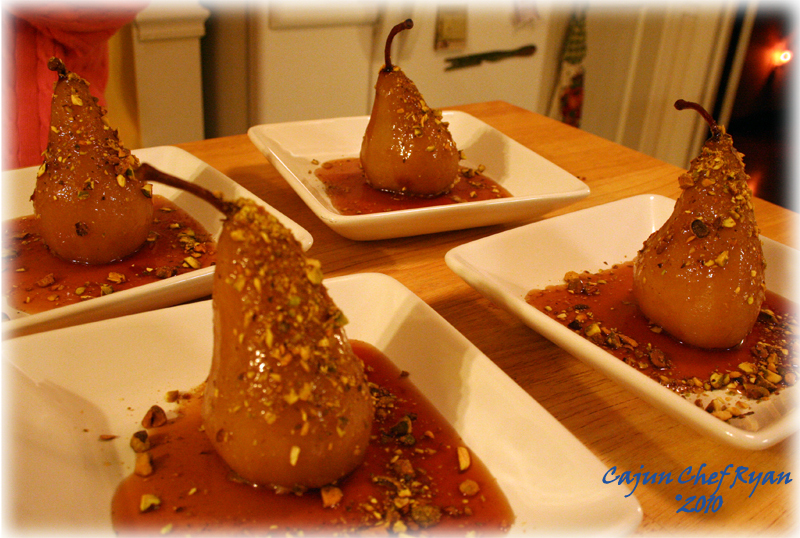 Poached Pears with Pomegranate Chardonnay Sauce, stuffed with apricots, vanilla wafers, and pistachios. This is a delightfully light yet chic dessert that can be made days ahead and then plated and served when guests are ready for dessert. And at only around 250 calories per serving, this dessert treat is a healthy alternative for the sweet tooth on your guest list. The sauce for this poached pear dessert is created from reducing and thickening the white wine pomegranate juice poaching liquid, creating a white wine pomegranate sauce. It was been years ago since poached pears had crossed my kitchen prep table, and this time it would be with a different stuffing and a new accompanying sauce. At Elmwood Medical Center around the 1988 time period, where the executive chef title on my chef jacket indicated I also had responsibilities for menu creation, and with the help of dietitians we developed a healthy dessert alternative using fresh pears and cheese. At the time it was poached pears with sage Darby cheese, which was quite a bit of prep work since the cheese is a hard variety. Imagine having to prep an entire case or two of these pears, peeling, coring, and stuffing about 150 to 200 pears is quite a time consuming challenge. This poached pear version was served with a raspberry coulis sauce, and was quite popular among our clientele. Today’s recipe for the poached pear is stuffed with chopped apricots and crushed vanilla wafers along with some chopped pistachio nuts. And don’t worry, it is written to yield only four pears! Actual prep time is about 30 minutes, cooking is another 30 minutes, and resting time is at least 2 hours. Hands on prep and cooking are less than an hour of effort. Peel the pears then core from the bottom without going all the way through leaving the stem side intact. 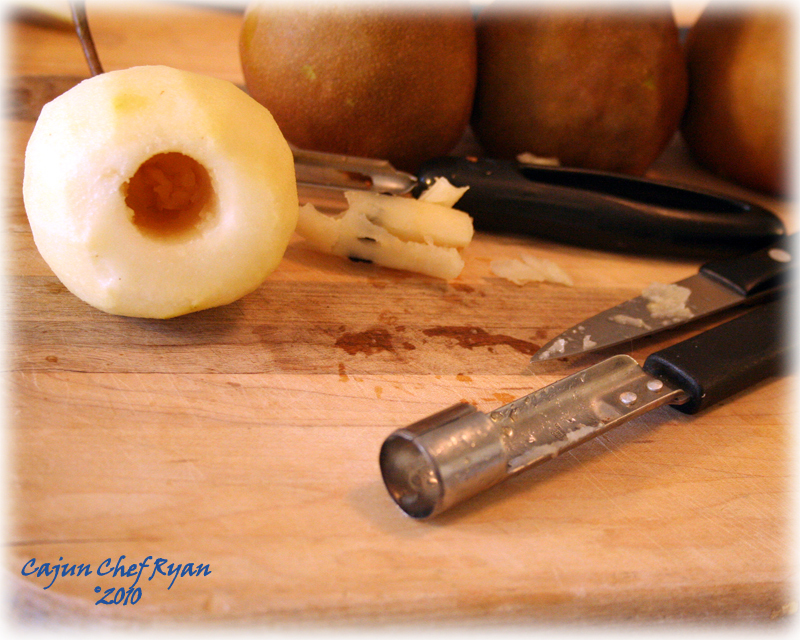 Then slice just less than ¼ inch from the bottom of pear to form a flat base for the pear to rest on when serving. Set the pears aside. Combine the wine, juice, sugar, honey, cloves, apricots, lemon ride, and vanilla extract in a large sauce pot and bring to a boil. 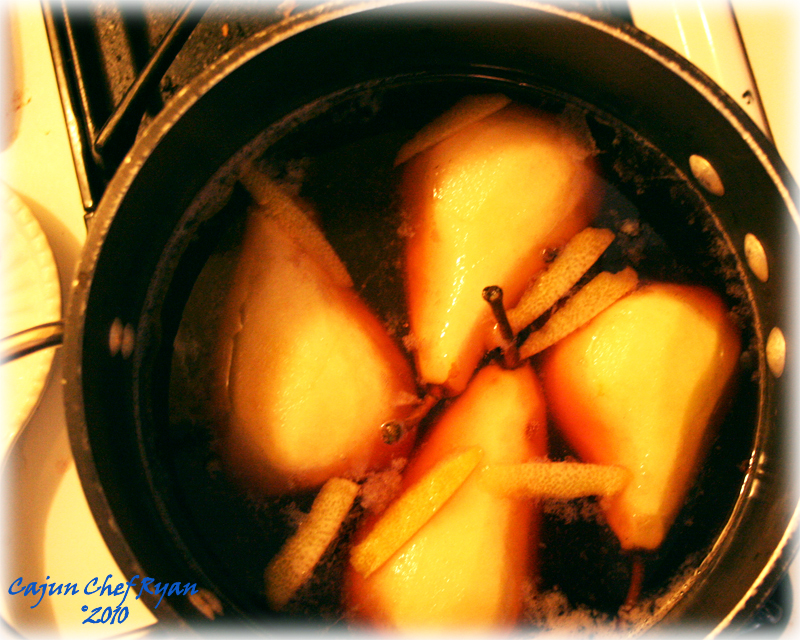 Add the pears, cover and allow to simmer for 20 minutes or until pears are tender. 3. Using a slotted spoon, remove the pears and apricots, and transfer them to plate then allow them to chill for at least 2 hours. 4. In the meantime, continue to simmer the poaching liquid until reduced to 2 cups liquid. Combine the cornstarch with about two tablespoons of cool water and dissolve until smooth, then whisk in the cornstarch slurry into the liquid reduction. Continue to simmer for about 10 minutes on low heat. 5. Coarse chop the apricots, and combine them in a small bowl with the crushed vanilla wafers and ¼ cup of the chopped pistachios. Fill the cored out cavity of each pear with the apricot, vanilla wafer, pistachio mixture and pack well. To Serve: Place one pear on plate then ladle ¼ of the sauce over the pear, sprinkle to garnish with ¼ of the remaining coarse chopped pistachios. Four of the poached pears ready to serve. I keep saying I”ll try poaching pears. This recipe might be the final push to actually do so. Sounds absolutely delicious. I have yet to poach a pear. These look beautiful and so delicious! This looks heavenly! I’d much prefer the current filling over the cheese. Great recipe! I don’t think I have ever poached anything, but if it tastes as good as it looks, I will try it! 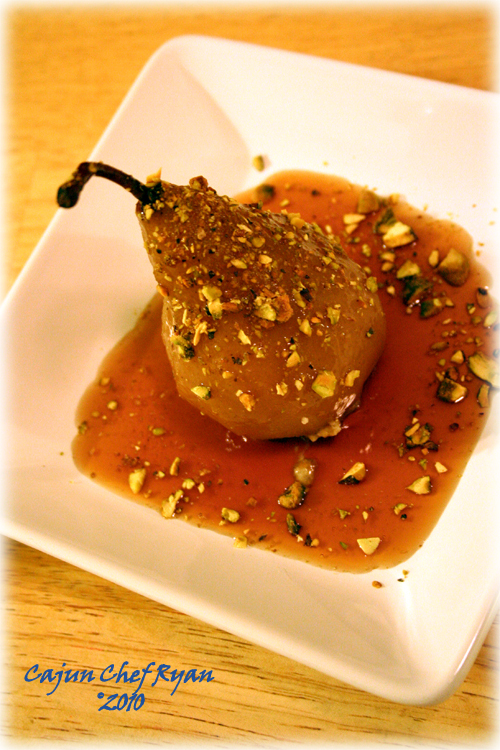 Poached pears are such a great healthy dessert – the pomegranate chardonnay saucing is a nice twist. VERY gourmet. Looks so pretty! What a beautiful dessert! 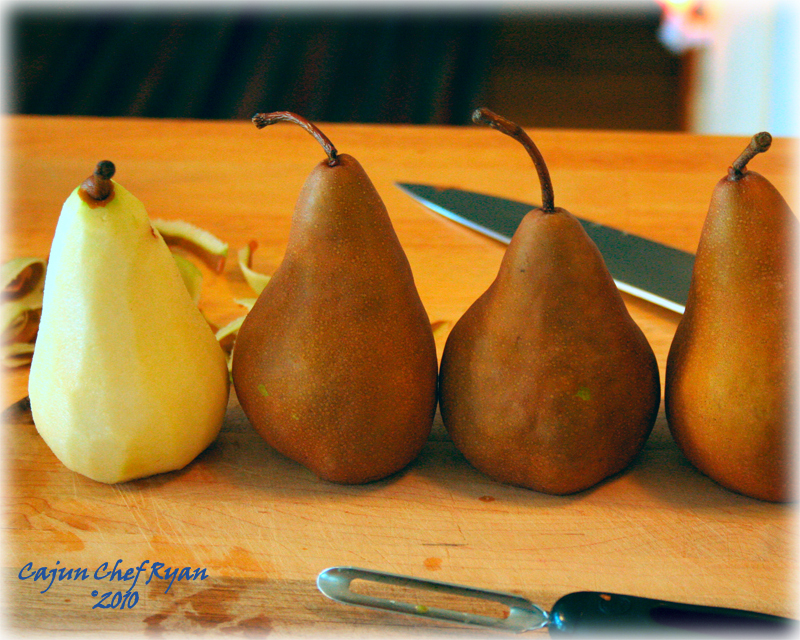 I was just thinking about poaching pears for a holiday dessert, thanks for sharing this! I absolutely love poached pears and these with the pomagranate and chardonnay look absolutely amazing. cant wait to try this out! I love pears, they remind me of my grandpa, they were his favorite. I love the poaching liquid and I have some POM juice left. Great recipe, thanks! I’ve wanted to try poached pears for a while now. This looks amazing! Are Bosc pears the go to pear for poaching? Oh the pears are just fabulous Chef. The perfect fall dessert! This is a beautiful dish and it looks delish! I love such fruit desserts and yours look so appealing with all flavors and pistachio on the top. I thought you would like this one, and I bet peaches would work well with a little alteration here and there. Such an impressive dessert. No one would guess is a light in calories. Truly pretty. I’ve saved this one! impressive presantation , looks delicious..
Pears are an oldie but a goldie but you’ve really jazzed these little fella’s up beautifully with the help of Pomegranate & Pistachio flavours and they still look classy don’t they. I love pears and these poached ones look delicious! Cloves, pistachios, pomegrante, what a great flavor combination. I’ll have to try this the next time we have someone over to the house. Lovely Pears! I love poached pears, but these are a step above with that Pomegranate Chardonnay Sauce. Yum!